THERE’S GOOD NEWS for people who are still without power after the recent bad weather: ESB Networks says that all of the faults will be cleared by tomorrow. Tonight, ESB Networks said that it expects that by this evening, only very small numbers of customers will remain without electricity following storm Darwin. Over the past week, ESB workers – helped by workers from the UK and Northern Ireland – replaced approximately 2,000 wooden poles, 500km of conductor and approximately 500 transformers. 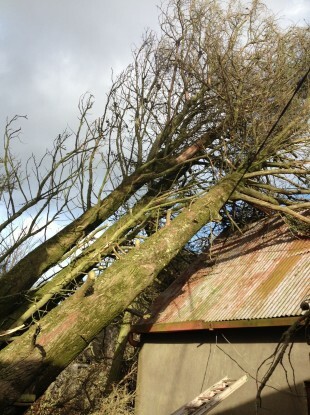 ESB Networks anticipates that all remaining faults will be cleared tomorrow. Customers still without power have been receiving calls from ESB Networks today updating them on the progress and letting them know when their power will be restored. If you’re a customer who lost power during the storm and you’re still without power by tomorrow evening, you’re asked to contact ESB Networks on 1850 372 999 in case your fault has not yet been identified. This afternoon, we’re working to clear all faults around Fermoy, Dunmanway and Killarney, and we will be working late into the evening to clear Tralee, Tipperary and Newcastlewest. The vast majority will be cleared by tonight, but a few may spill over to tomorrow. He thanked customers who lost supply as a result of the storm for their patience and understanding. “The support that we got from the communities we were working in really helped to keep morale up among the crews, who were working night and day in miserable conditions to restore power,” he added. The ESB has an application where people can find out the estimated restoration time of their electricity supply. Email “Good news: All electricity faults to be cleared by tomorrow”. Feedback on “Good news: All electricity faults to be cleared by tomorrow”.